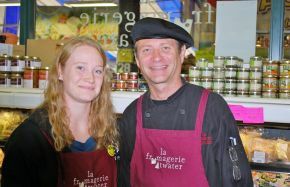 Acquired by the Jourdenais family in 1976, La Fromagerie Atwater, located in Atwater Market in Montreal, is a family success, now with two locations to serve you better. Having taken over from his father in 1983, after working at the cheese shop every summer of his youth, Gilles Jourdenais discovered a passion for cheese and fine foods. Always on the lookout for new products, Gilles has traveled extensively and loves to share his culinary knowledge with his customers and employees. Since 1983, the family-run cheese shop has expanded four times to house a growing inventory now consisting of more than 850 varieties of cheese, including many from Quebec, and deli from Quebec and around the world, dairy, fine groceries and mostly Quebec microbrewery beers.